SOLAN (HP): BJP chief Amit Shah today gave a clarion call to party workers to “uproot the corrupt” government in Himachal Pradesh and make India “Congress-free” by bringing BJP to power with majority in the Assembly elections due next year. “Prime Minister Narendra Modi’s Vijay Rath will reach Himachal Pradesh after conquering Uttar Pradesh and Uttarakhand in Assembly polls. The Congress government in the state will also fall and India will become Congress-free,” he said at a conclave for booth-level BJP office bearers of Shimla (Reserve) Parliamentary constituency here. Defending the Centre’s demonetisation move, Shah attacked previous UPA governments and the Virbhadra Singh dispensation “for patronising corruption”. Hitting out at those raising a “hue and cry” over note ban, he claimed that “only those with piles of black money are feeling the heat. The common man has no problem and has welcomed the move”. “Demonetisation is a lethal step to destroy a parallel economy that runs on black money, choke funding to terrorists, stop extortions by Naxalites and take on fake note rackets,” he said. Shah said the Prime Minister while announcing the decision to scrap high-value notes on November 8 had said that there would be some inconvenience for the initial 50-day period. Twenty-five per cent of black money deposited with banks will be used for the welfare of the poor. 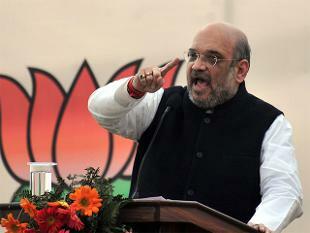 50 per cent will be deducted as tax and 85 per cent penalty will be imposed on undisclosed money, the BJP chief said. “The country has a Prime Minister who speaks out, has dialogues with people, understands problems of the masses, cracked down on black money and rolled out 92 public welfare schemes,” Shah said. The Centre’s efforts will yield results when a BJP government is installed in the state, he asserted.